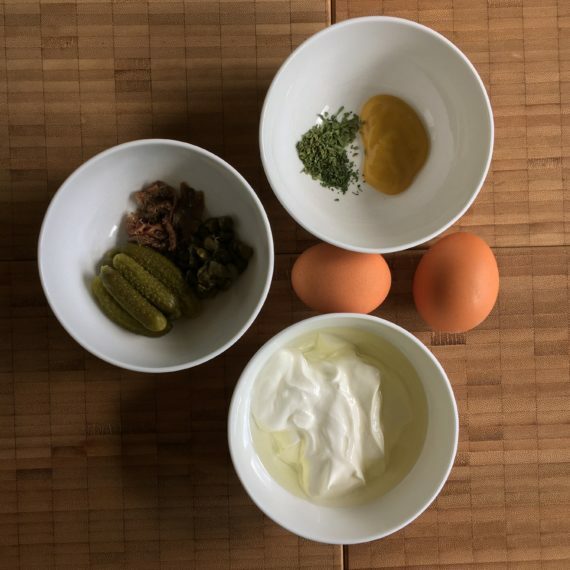 Despite all this handiwork it’s a fast remoulade, a simple approach which may present your very own idea of remoulade flavour. …& mix the Greek yoghurt w/ the oil (I had peanut oil & lemon flavoured oil) & add salt & pepper to taste. 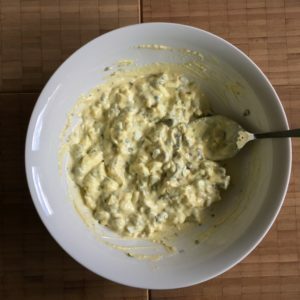 Lemon flavour is inevitable in remoulade – that’s my personal opinion. You may also add some splash of white vinegar, but it’s another flavour coming in w/ the vinegar. Furthermore I have – at the moment – this wonderful lemon flavoured oil. Maybe one day it isn’t any longer available… then I’ll resort to freshly grated lemon zest – of course! Now we mash the egg yolks & add the mustard (I had sweet mustard) & the dried herbs. I used dried herbs because I hadn’t any fresh herbs at this special moment. You may substitute w/o hesitating. Mix everything w/ the yoghurt mess. Now add the finely chopped cornichons, anchovies & capers. Mix. 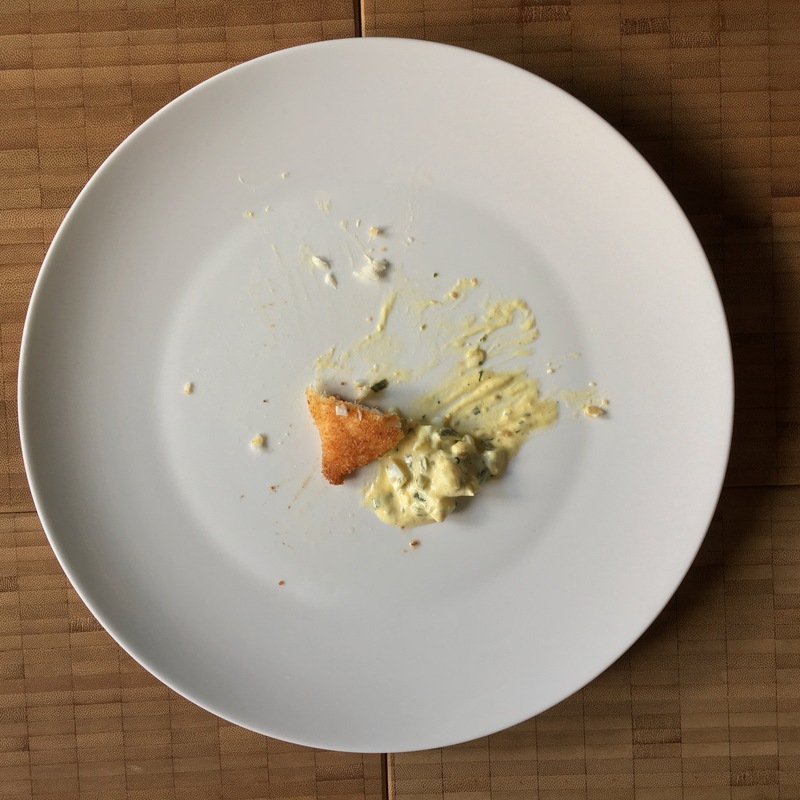 Attention: This isn’t a remoulade based on mayonnaise, but made with Greek yoghurt and oil. 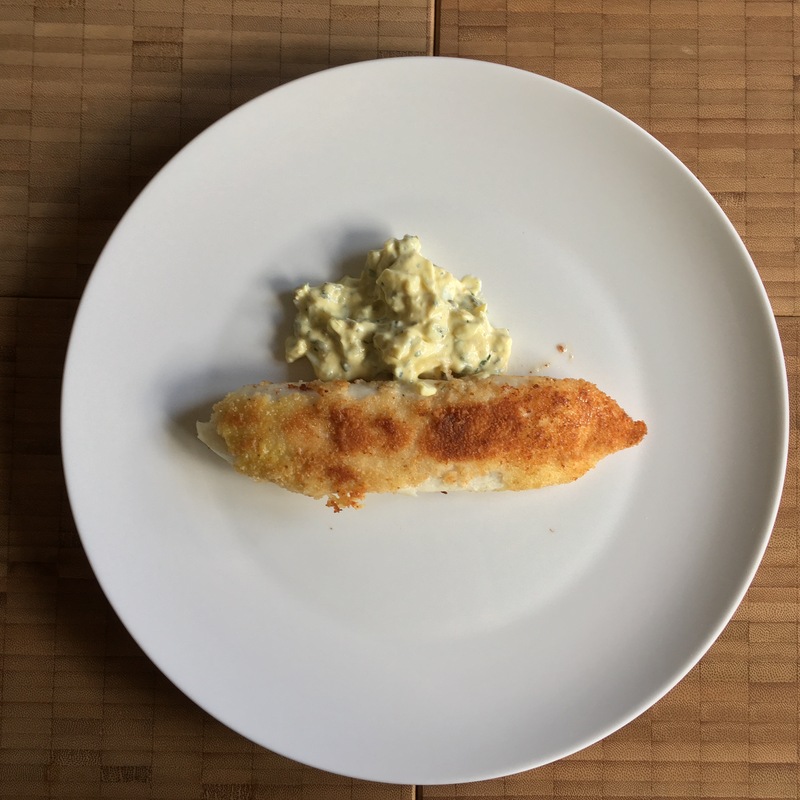 It tastes like original remoulade, but is somewhat lighter without any artificial stuff to support lightness. Boil 2 eggs if you can’t grab any hard-boiled eggs out of your fridge. Mix the Greek yoghurt w/ the oils & add salt/pepper to taste. 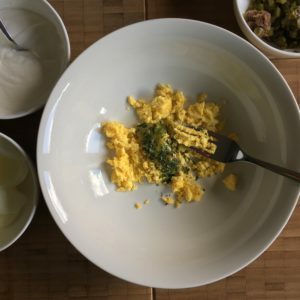 Mash the egg yolks w/ sweet mustard & the dried herbs w/ a fork. Add a splash of vinegar to taste. 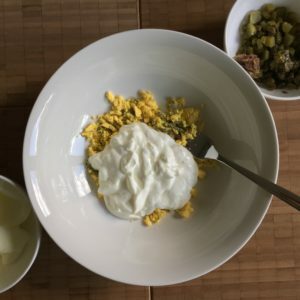 Add the egg yolk mess to the yoghurt mess & mix. 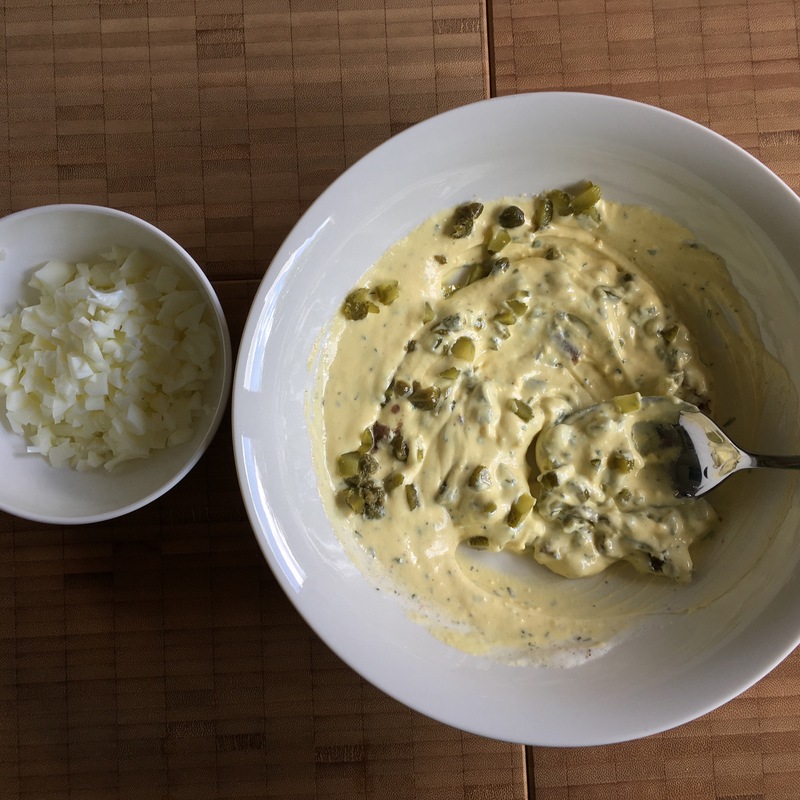 Chop the cornichons, the capers & the anchovies & mix w/ the egg yolk mess. 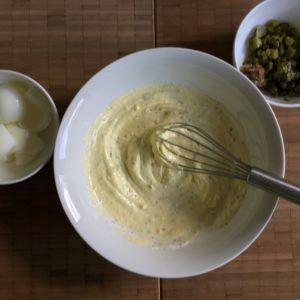 If you like you can also chop the egg whites & add to the remoulade. 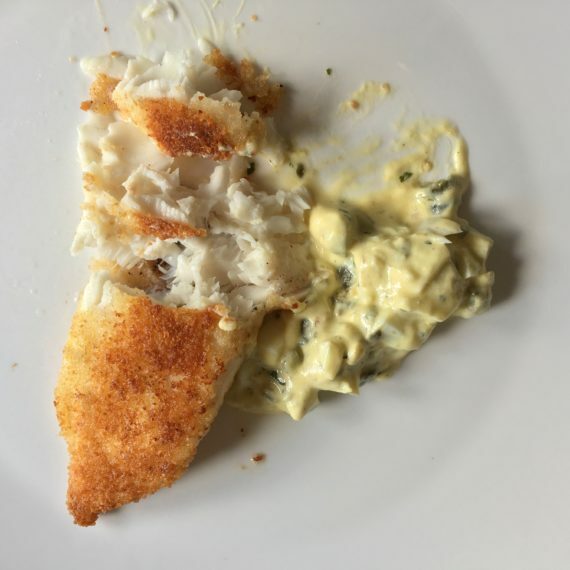 Oil w/o flavour of its own: Of course you can also add a fine delicate olive oil ( extra vergine ...), but be aware of the olive oil flavour’s impact on the remoulade! Lemon flavoured oil: You may also use some freshly grated lemon zest. 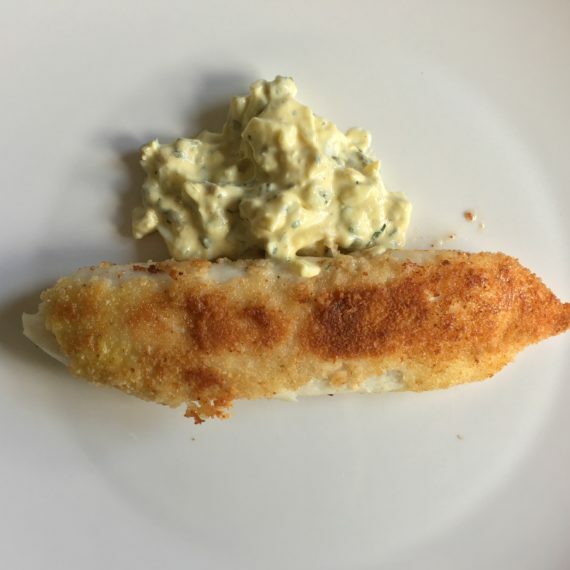 Sweet mustard: You may also use just mustard, however, be aware that there will be an impact on the flavour of the remoulade! Vinegar: I prefer a light vinegar of white wine - of course you can also add your preferred vinegar, even balsamic vinegar. Dried herbs: I worked w/ dried herbs because fresh herbs weren’t available at this moment. If going w/ fresh herbs substitute a tablespoon for a teaspoon. 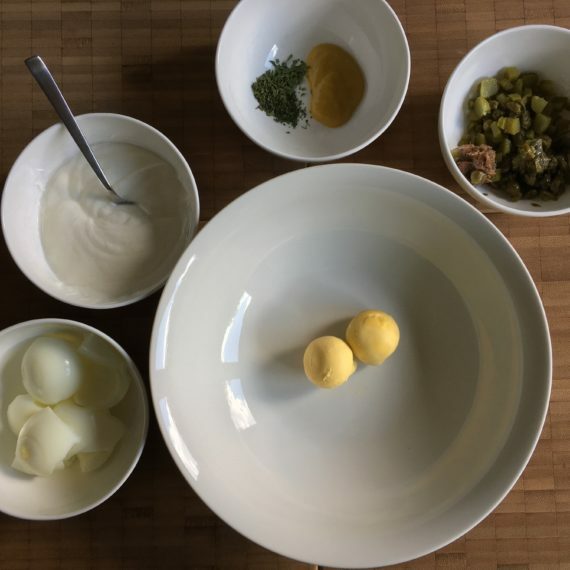 At first: once again many thanks to my friend Frieder who introduced me how to make mayonnaise w/ yoghurt & oil (you certainly remember my asparagus salad & my approach to vitello tonnato). 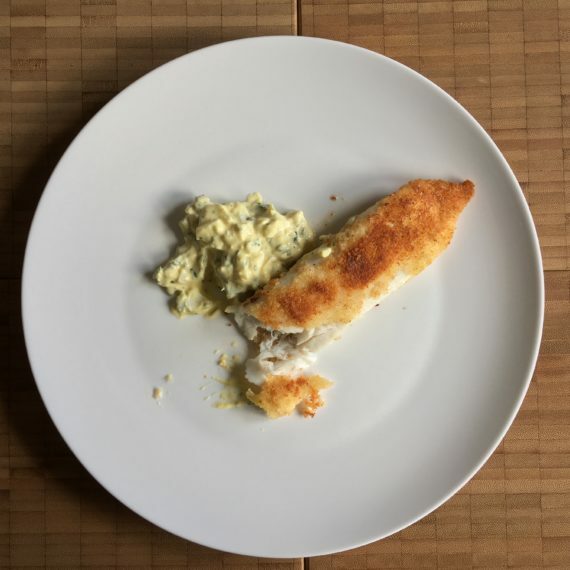 I think I successfully transferred his idea to remoulade now. 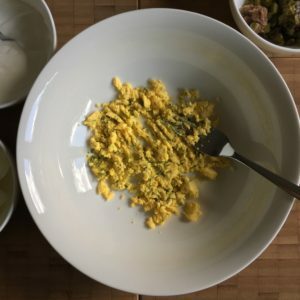 Did you notice that I stayed somewhat vague about the ingredients from time to time? Which type of & how much of vinegar? 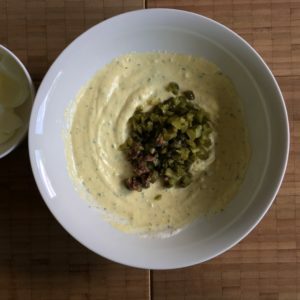 Remoulade opens a great variety of flavors to be added to become a really hearty remoulade. So just try & substitute your preferred stuff for my suggested stuff. Is there any more which needs to be discussed about this approach?